I had hoped to post this yesterday for Memorial Day but found myself far from any internet connection. Even today I don’t have access to photoshop so I can’t set the scan straight. But I found this letter so moving that I’m going to post it as is, with apologies. I came across it recently, quite unexpected among a box of unrelated material. Here’s my original post from Christmas two years ago about Lieutenant La Prade. I wonder, are letters like this still written? That is such an eloquent letter! I never know what to say in such situations, but might find some inspiration here. Thanks for sharing this with us. 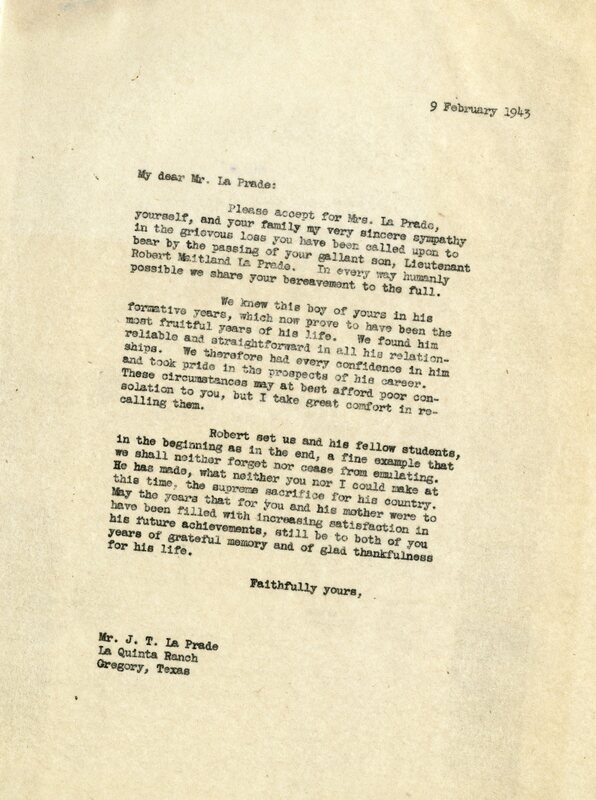 Condolences letters of the period 1850-1950 are impressive to read. Invariably, they follow certain principles that people today would do well to remember: they include a personal recollection if authentic, but do not if not; they do not pretend to minimize the loss; they do not contain empty promises; and while they may express a wish for comfort, they do not offer psychological advice. Good rules to follow.